The Hindustan Times Scholarship programme ( for students of classes V to X ) is a unique endeavour. It seeks to recognise and reward the brightest young minds. And it seeks to do so in a manner that transcends the conventional means of rewarding a child by assessing her academic performance. This programme, one of the several initiatives by HT in the field of education was launched in 2011 in Mumbai. Over the years, more than 4 lakh students have participated in the program from 250+ schools. When we rolled out the inaugural programme in 2011 in Mumbai, we had not anticipated the overwhelming response we were to receive. We got more than 27,000 applications. Last year, we got the highest participation from Mumbai with 84000 applications from more than 200 schools. We also launched the programme in Pune and Chandigarh last year and received an overwhelming participation from 40,000 students. What sets apart this initiative from other programmes is the selection process. In addition to the academics, a student’s creativity, originality and extracurricular interests are also taken into account. The initiative as a whole helps students to come forward and realise their hidden talent. Many celebrities like Shabana Azmi, Rajkumar Hirani, Huma Qureshi, Imran Khan, Ayushman Khurrana, Kriti Sanon and Sushant Singh Rajput have shown their support and been a part of this unique initiative. This year we are back again to reward 120 students with scholarships worth Rs. 45 lakhs. It isn’t just the money, of course. The award means a great deal for each of the deserving children; it makes a big difference to their lives. 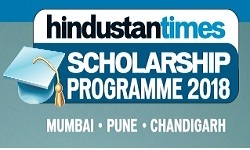 This year, the Hindustan Times Scholarship programme will again be rolled out in Mumbai, Pune and Chandigarh. Download the nomination form. Fill the form and send it along with the essay and any 5 HT Scholarship quiz cuttings to the following addresses. Students will be shortlisted for interviews on the basis of their essay, academics and extracurricular achievements, by a team of experts. A panel of senior editors will interview the shortlisted students and select the winners. Winners will be felicitated at a special award function. One thought on "Hindustan Times Scholarship Programme"